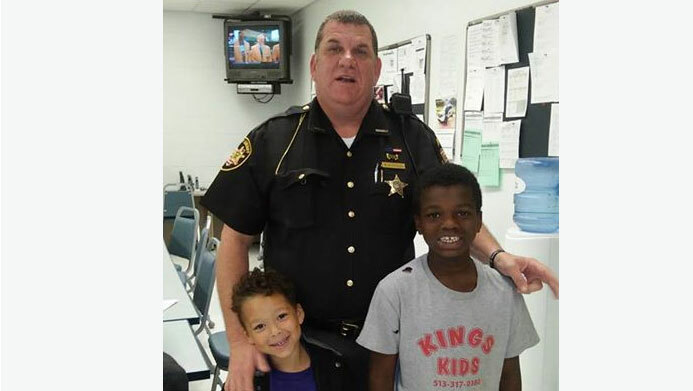 HAMILTON, Ohio -- A southwest Ohio sheriff's office is praising one of its deputies who quietly went out of his way to help a homeless family he spotted in a jail waiting room. The Butler County Sheriff's Office says 25-year veteran deputy Brian Bussell first saw the woman and her two young children sitting in the waiting room Sunday morning. He asked if something was wrong, and she told him she had been evicted from her home. The Butler County Sheriff's Office posted about the incident on their Facebook page. "I know our visitation is at 9 AM, and I saw the lady and the two young children sitting in the chairs," Deputy Bussell said in the post. "I assumed they were here to visit someone in our jail. When I walked back out a while later, the children were asleep, and the lady was still sitting there, so I inquired if she needed assistance." He tried unsuccessfully to get her into a shelter and instead paid for a hotel room for her for 10 days. He also took the family to a Wal-Mart and bought clothes. The little boys asked if they could get shoes, and Deputy Bussell told them they absolutely could. "I am pleased that he was able to help this family out," Butler County Sheriff Richard K. Jones said in the Facebook post. "This speaks volumes in light of all the recent negativity people are saying about law enforcement. I have some of the best employees here." Bussell didn't tell anyone at work. Others found out when the woman took a photo with him and posted it on Facebook.